Intel’s family of Intel® ...Ethernet X520 Server Adapters with SFP+ connectivity are the most flexible and scalable Ethernet adapters for today’s demanding data center environments. Data center networks are being pushed to their limits. The escalating deployments of servers with multi-core processors and demanding applications such as High Performance Computing (HPC), database clusters, and video-on-demand are driving the need for 10 Gigabit connections. Customers require flexible and scalable I/O solutions to meet the rigorous requirements of running mission-critical applications in virtualized and unified storage environments. Powered by Intel’s third-generation 10 GbE network controller, the Intel® Ethernet 82599 10 Gigabit Ethernet Controller, the X520 server adapter family addresses the demanding needs of the next-generation data center by providing unmatched features for virtualization, flexibility for LAN and SAN networking, and proven, reliable performance. 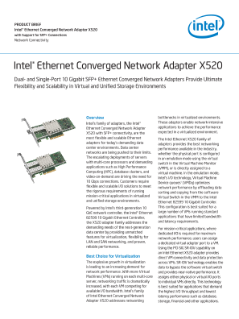 Read the full Intel® Ethernet X520 Server Adapters Product Brief.